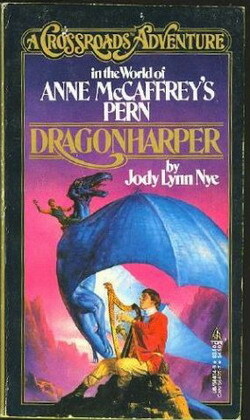 Also a title in the Dragonriders of Pern series. A Crossroads game book, set on the world of Pern, follows the adventures of Journeyman Robinton, age 15, on his way to his first official posting in Benden Hold. Depending upon the roll of the dice, Robinton will succeed or fail to reach his goal. Along the way, he'll encounter danger at sea, beautiful women, and the joyous pride of Pern, dragons! If you find this site at all useful, please help to keep it on-line. There is no commercial backing so any donation, no matter how small, would be welcome.